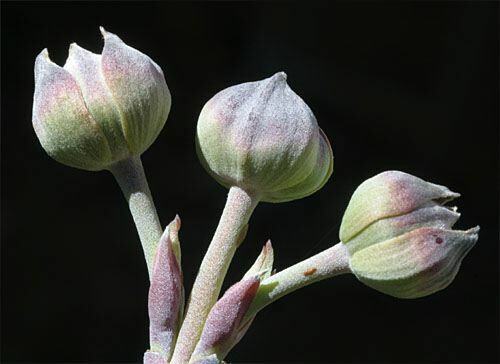 When we ask students and other visitors at Hilton Pond Center to define "spring," they sometimes wax poetic and often employ words such as "green," "warm," and "rebirth," but those kinds of terms are a little misleading. After all, the current first day of spring came this week for everyone in the United States' entire eastern time zone, and we're betting folks in Upstate New York and Maine aren't even thinking about "warmer" and "greener" just yet, much less "re-birth." Actually, the only acceptable definition for spring for the Northern Hemisphere is an astronomical one that describes the moment when the Sun is directly over Earth's equator, just before it passes northward. This year, the celestial event occurred at 1:49 a.m. EDT on 20 March, marking the "vernal equinox" and the first official day of the spring season. From now until the summer solstice on 20 June--when the sun reaches the Tropic of Cancer and starts back southward--we'll have an increasing number of daylight minutes, and those will indeed lead toward warmer days and lots more green than we've had all winter. The green-up of spring actually has been underway for at least a few weeks in the Carolina Piedmont. It finally hit its stride this week as temperatures climbed into the upper 70s and the sun shined brightly--all of which reminded us to look for signs of spring around Hilton Pond Center. For many folks the first blooms of Flowering Dogwood, Cornus florida, symbolize spring, but this tree's special floral buds (above) are just beginning to swell and won't be fully open for another week or so. Thus, in our judgment, the dogwood flower comes too late to be a true sign of spring. The Red Maple, Acer rubrum, is another early-blooming tree, but its flowers are produced so early that it's almost a harbinger of late winter rather than the coming of the spring season. In fact, this week all the Red Maples around Hilton Pond are festooned with clusters of red. 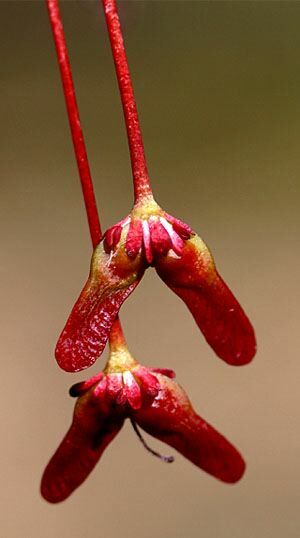 From afar these might appear to be flowers, but they're actually scarlet-colored samaras (above left)--the helicopter-like seed pods that make Red Maples among the earliest-fruiting plants in the Carolina Piedmont. 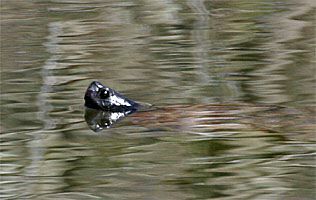 Members of one group that visited the Center this week said they thought a sure sign of spring was the appearance of Painted Turtles, Chrysemys picta, and Yellowbelly Sliders, C. scripta, floating about on Hilton Pond and sunning themselves on its banks. Believing that reptiles are "supposed to" hibernate in winter, the students were surprised when we told them turtle activity didn't qualify as a spring phenomenon because those same turtles sometimes can be seen during an unseasonably warm day in December of January. We suspect most turtles don't truly hibernate in the Carolina Piedmont, so long as their local pond isn't frozen over, allowing an adventuresome Yellowbelly Slider (above right) a place to stick its snout above water. Closer than turtles to being a sign of spring might be some of the aquatic algae--a diverse collection of oft-overlooked plant-like organisms that also grow in Hilton Pond. In winter, short day length means some terrestrial plants can't photosynthesize enough to maintain their basic needs; these species typically lose their leaves and curtail activities in winter. For aquatic plants and algae, however, it may be that water temperature is just as important as how much light is available; if the water's too cold, chemical processes that bring about cellular metabolism cease to occur, or at least slow dramatically. 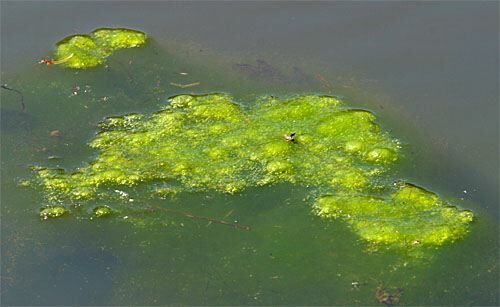 One of the first indications that water temperatures are warming in Hilton Pond is the sudden appearance of filamentous green algae. These photosynthetic organisms--including the familiar Spirogyra sp. studied in high school biology classes--are quite prolific on warm days, when they form large mats (above) that float to the surface on tiny oxygen bubbles formed by photosynthesizing cells. We've been observing this activity for a couple of weeks, however, so to our way of thinking an algal "bloom" doesn't really qualify as a sign of spring. Some folks believe early-blooming Bradford Pears should be considered our official sign of spring, to which we say "NOT!" These nearly ubiquitous non-natives are perhaps the most over-used landscape tree in recent history, and are not worthy of the honor. Same goes for daffodils, crocuses, camellias, and any other imported herbs and shrubs. And even native animal species such as American Robins don't count as a sign of spring in the South, mostly because they've been with us all winter. 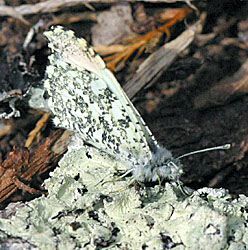 Were we more familiar with their life histories, we might say a species of butterfly should be tapped as the organism that gets to say spring has arrived--perhaps the nicely camouflaged Falcate Orangetip, Anthocharis midea, we photographed this week perched on a piece of similar-looking lichen (male, above left). Instead, however, we've come to associate the arrival of spring at Hilton Pond Center with one annual phenomenon that always gives us something to look forward to after a long cold winter: We declare it finally to be spring when we see the first blush of purple blooms along the twigs of our plentiful Eastern Redbuds, Cercis canadensis (above right and below). These fast-growing native trees--giant members of the Pea Family--typically bloom when the calendar shows spring has arrived. 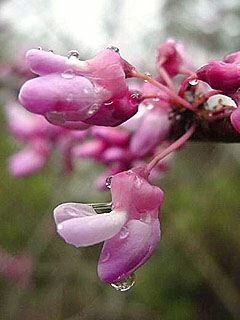 This year, in fact, the redbuds were amazingly accurate; they bloomed not on 20 March--the first day of spring--but on 21 March, which happened to be the first FULL day of the new season. 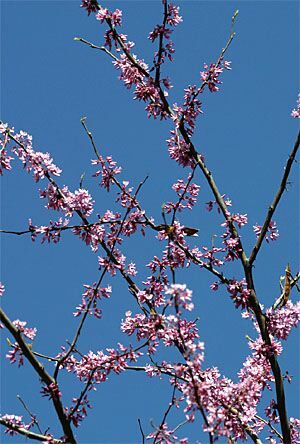 We thus conclude you can't beat the redbud bloom as the one true sign of spring around Hilton Pond and in the Carolina Piedmont. --After averaging more than 16 birds banded each day at Hilton Pond Center through the first 2.5 months of 2004, the bottom dropped out this week with the sudden departure of our previously plentiful Purple Finch population. Several days of warm weather apparently also prodded many resident birds into dining on emerging insects and succulent buds; it's for certain they weren't at all interested in sunflower seeds, white millet, and cracked corn that gave them winter sustenance at our feeders--and that enticed so many birds into our traps. --Also stimulated to depart by this week's warm weather and/or longer day length was our winter resident flock of a dozen or so Ring-necked Ducks, which disappeared on 18 Mar. We suspect they're now winging their way from Hilton Pond toward their breeding grounds in the northern U.S. and southern Canada. In other words, M.R. Ducks R Gone. In 2004, informative and entertaining hummingbird banding presentations are already scheduled for North Carolina, Ohio, Virginia, Michigan & Kentucky/Tennessee.